A Frank Wild memorial plaque. Episode: 33. Site Number: 121. Date Posted: 5 January 1997. Updates: 12 March 2000, 24 November 2010. Location: Eversholt, Bedfordshire, England. Type: Memorial/Plaque. If Oscars were given out to Antarctic explorers, Frank Wild would surely have picked up a few in the "best supporting" category. Can anyone else claim to have participated in five 'heroic age' expeditions? His five: Scott's Discovery expedition, Shackleton's Nimrod, Endurance and Quest expeditions and Mawson's 1911-14 expedition. Born in 10 April 1873 at Skelton, No. Yorkshire, he died on 19 August 1939 in the Transvaal where he had gone to raise cotton. The Polar Record (17:107) has a brief note on the December 16, 1973 unveiling of a memorial plaque to Wild in a Bedfordshire church. There is some correspondence at SPRI about the plaque. Apparently Sylvester Crozet proposed that a tablet be erected in a Johannesburg crematorium (presumably where Wild's ashes are; another 'Low-Latitude' site to track down), but Wild's family--represented by Frank's brother, Stanley O. W. Wild--". 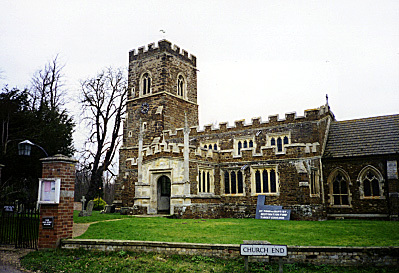 . . unanimously agreed that it would be more appropriate to install a plaque in the Parish Church [St. John the Baptist] of Eversholt, Bedfordshire, the family home for 23 years, where most of us were brought up, and from whence Frank Wild set off in 1901 to join Captain Scott on his first Antarctic Expedition." The specifications for the plaque indicate that it was "to be sited centrally, nine feet from the floor, on the North Wall of the tower" of the church; and that it be of slate, "approximately 24" x 12" x 1" thick, with a bevel worked all around the face edge, smooth satin finish . . . the lettering to be incised only." The wording is to read: "In loving memory of Commander Frank Wild R.N.V.R., C.B.E., F.R.G.S. of this Parish, Freeman of the City of London, Antarctic Explorer who accompanied Scott, Shackleton and Mawson on Five South Polar Expeditions between 1901 and 1922." I visited Eversholt in January of 1998. Close to Woburn, it is a lovely little village. The church was locked but I fetched a key from a man at Church Farm across the way. He pointed out the nearby house that he thought was Wild's. This fellow alone was worth the trip: he restores vintage racing cars and keeps peacocks--which were wandering around the village--llamas and wallabies! "Evans was the last of the Antarctic explorers to see Wild alive. On 19 August 1939 Frank Wild died. He was sixty-five years old. His death certificate recorded his occupation as Belasco Mine storekeeper, at Klerksdorp, (in the Transvaal) and his death as due to pneumonia and diabetes mellitus. His funeral, at the Brixton Cemetery in Johannesburg, was a simple religious service that lasted less than twenty minutes. There was no funeral oration and little ceremonial. A boy bugler sounded the last post. Apart from his wife and her relations, the funeral was attended by officers and sea cadets of the Witwatersrand branch of the Navy League of South Africa, a soldier VC, a farmer from Kenya who had known Wild in Nyasaland and two farmers who had also suffered from the severe drought in Mkuzi. There were wreaths from the South African Geographical Society and the Explorers Club of New York [Rand Daily Mail 24 August 1939]. . . .
Wild's body had been cremated after his funeral service and after a while the ashes were buried in a grave in the cemetery. Many years later - in 1966 [18 April 1966] - the Johannesburg daily newspaper, The Star, reported a search for Wild's grave. It could not be found." "Evans was the last of the Antarctic explorers to see Wild alive. On 19 August 1939 Frank Wild died. He was sixty-five years old. His death certificate recorded his occupation as Belasco [Babrosco] Mine storekeeper, at Klerksdorp, (in the Transvaal) and his death as due to pneumonia and diabetes mellitus. His funeral, at the Brixton Cemetery in Johannesburg, was a simple [It was not simple at all and it took place at the Braamfontein Cemetery] religious service that lasted less than twenty minutes. There was no funeral oration and little ceremonial. [Well over 50 people attended the funeral.] A boy bugler sounded the last post. Apart from his wife and her relations, the funeral was attended by officers and sea cadets of the Witwatersrand branch of the Navy League of South Africa, a soldier VC, a farmer from Kenya who had known Wild in Nyasaland and two farmers who had also suffered from the severe drought in Mkuzi. There were wreaths [over 40 from the South African Geographical Society and the Explorers Club of New York [Rand Daily Mail 24 August 1939]. . . .